TOKYO, December 15, 2008 --- SOFTBANK MOBILE Corp. and SOFTBANK TELECOM Corp. announced that they will launch ‘White Office’ around the end of March 2009, which is FMC*1 service that enables corporate customers to use SoftBank handsets as extension of fixed-line telephone. 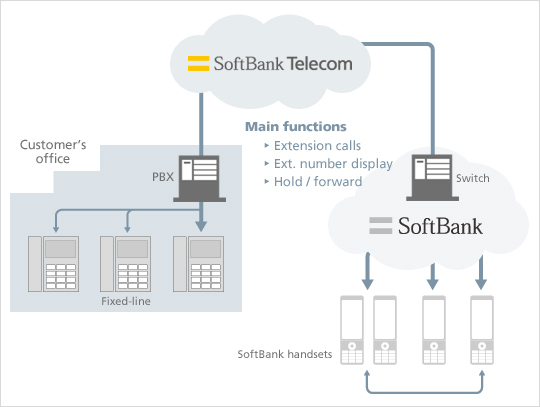 White Office is a service that allows customers to use SoftBank handsets as extension telephone, and handles calls between mobile handsets as well as between mobile and fixed-line as extension-to-extension calls regardless being outside or in the office. Key functions of conventional extension are available on mobile as well such as calling extension number display, hold and call forwarding, which renders a feeling of having an omni-office. In addition, White Office can be introduced for use by mere change of the setting of a private branch exchange (PBX)*2 in current use without spending big additional capital expenditure. Flat rate for extension calls is planned to be offered for introduction and use at ease. By converging mobile and fixed-line telecommunications in a company, White Office brings all from improvement of productivity and customer satisfaction to reduction of initial cost and communication cost. The SOFTBANK Group continues to leverage its integrated capability to actively proceed with convergence of mobile and fixed-line telecommunications and to offer leading-edge service of high added value. Details of White Office including service contents and prices are to be announced upon finalization. *2 Connection with a supporting switch is required. * White Office is a trademark of SOFTBANK MOBILE Corp.
* SOFTBANK, SOFTBANK’s equivalent in Japanese and the SOFTBANK logo are registered trademarks or trademarks of SOFTBANK CORP. in Japan and other countries.